On any given day we tend to mix in school lessons with a lot of self- guided work and discovery. I try to keep our work load light so the kids have plenty of time to pursue their own passions. It also allows us plenty of time to fit in errands when needed. I find the boys are more cooperative and we all feel better when we take a more relaxed approach to our traditional schoolwork. Alec amazed me. He was up, dressed, had eaten breakfast and brushed teeth by 7 this morning. He, who usually hates to get up, was the first one ready today. He even beat me! The boys all played with their toys, with Legos and even with video games until 10 or so when I told them it would probably be a good idea to start our school day. The boys all did a bit of writing work today too. Ian copied the final draft of this month's postcard onto his postcard while Alec worked on his rough draft. That's pretty much what a typical day of learning looks like in our house. 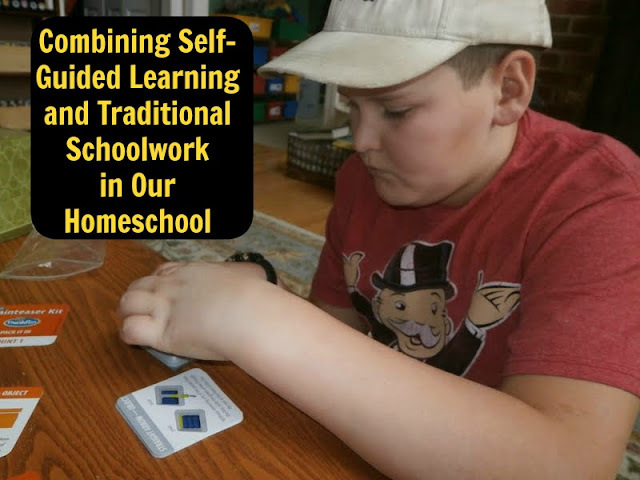 What does a day of learning look like in your house?